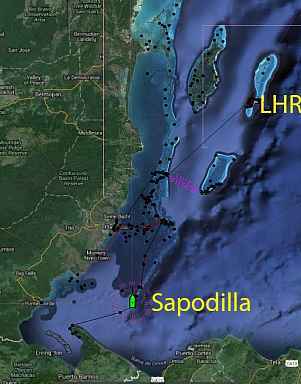 This blog comes to you from the Sapodilla cays, which are in the south-eastern corner of Belize. Sue & I haven't been here since 2002, where we spent a windy and bumpy Thanksgiving. I must admit that my memories of the area were quite foggy, so we decided to check out the area again. On top of that, a boat that we knew (s/v First Light) was down here and was extolling the diving/snorkeling, so we wanted to enjoy some final time in the water before heading into Guatemala. We departed Rendezvous Cay and headed S towards the Sapodilla cays. Ranguana cay is the northern most member of the Sapodilla cays, but according to our notes, it's very hard to anchor there, so we decided to keep moving along. Unfortunately I hadn't checked the ActiveCaptain reviews which stated that there was now a mooring field and a good restaurant on the cay. So we headed down to Nicholas Cay where we found First Light picking up their anchor and heading to Lime Cay. First Light had told us about the great holding and snorkeling at Nicholas, so we decided to anchor there. As they were departing they mentioned on the VHF that it was very tricky getting into the anchorage. That would be an understatement! There's basically a shallow S-curve channel that leads its way into the anchorage between beds of coral. We started to work our way in, but spun ourselves around when it got too shallow and there were tons of coral heads. So we headed to Lime Cay, which was where First Light was heading. On the charts, the approach to Lime Cay looks straight forward. You should be able to pretty much just go straight in and find an anchoring spot free of coral. What the charts & guide fail to mention is that the holding is terrible for much of the area. We found a nice sand spot and were able to anchor free and clear of coral. What was quite humorous was that there were 3 other boats simultaneously anchoring. I'm sure that the locals were wondering what the heck was going on with all of these boats anchoring at the same time. First Light and 2 French boats were trying to anchor and had snugged themselves close up to the island to get protection. However, none of them could get their anchor to set and at one point First Light got their prop fouled by a line in the water right in front of a French boat who was pulling up their anchor, leading to some close conflict. Luckily no one hit and eventually everyone found some place to anchor about 1/3+ of a mile away from the island, basically turning this anchorage into an open roadstead. 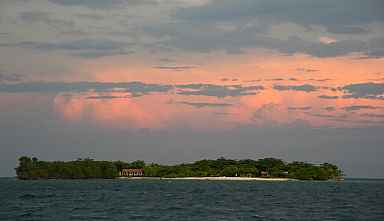 The picture to the right is of Lime Cay and those glowing clouds aren't just some benign clouds lit at sunset. They're the base of a major storm cell that luckily just missed the area. However, we were in a diurnal wind patter where the winds would build into the mid-upper 20s, peaking at around 9 PM, and then die down. 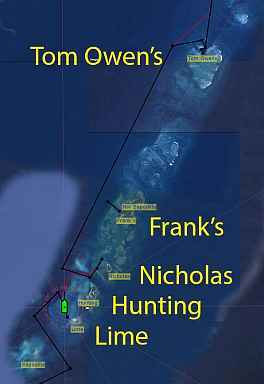 Given that we were had basically no protection from any of the cays, this made for a pretty bouncy anchorage. The next day we decided to move to Frank's cay, which looked like it would offer a lot more protection, if we could get up close to it. Based upon a blog from 2002, Sue & I managed to get anchored there, but bumped on the bottom at low tide. Well, this time we couldn't get the anchor to stick in the thick turtle grass and it shallows quickly as you approach the cay, so we moved back to Lime. First Light had moved to NW Sapodilla (just N of Frank's) and had found a spot where a single boat could anchor in 30'+ of water. After another windy/bumpy night at Lime Cay we had enough and decided to head to Cabo Tres Punta in Guatemala a day earlier than planned. I guess that the Sapodilla cays just aren't for us. What I don't understand is that this area is a park where they charge $10 USD/pp/pd to stay there, yet they don't provide mooring balls to protect the coral and/or make it possible for more people to visit. What is this money being used for? I'm going to guess that this will be my last blog from the Sapodillas as there's little there make me want to go back. Yes, there was some nice snorkeling, but the open roadstead anchorage isn't worth it. From here we'll head back to Guatemala and get the boat ready to store for hurricane season.